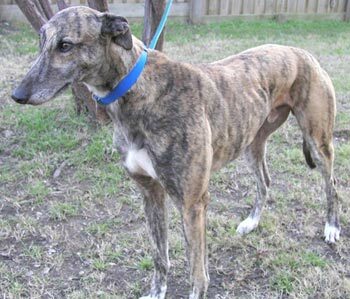 Rocky, aka Hot Daddy, is a handsome 3½-year-old brindle male born July 5, 2000. Rocky's sire is Flying Bookie and his dam is Snowline. He, along with Logan, comes to GALT from Ft. Worth Animal Control. Rocky and Logan were part of a group of 5 dogs that were found running loose in the Ft. Worth area. The three others are greyhound mixes that are definitely part Borzoi or Wolfhound, as they have very wiry coats. 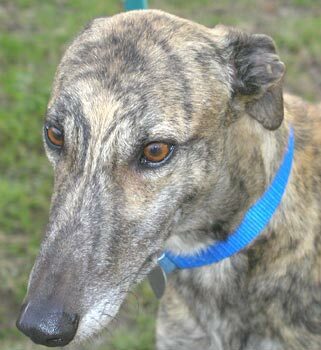 According to Greyhound-Data.org, Rocky does not have a racing history. He is a very affectionate and loving grey, who just wants to be with humans. Rocky is small animal and cat tolerant. Happy, playful and curious best describe Rocky. He wears a grin on his face most of the time and curls the tip of his tail like a fish hook. He has a very distinguished, carefree way about him. Rocky is very outgoing and seems to genuinely love being with people. He also gets along very well with our greyhounds and lab. Rocky spends a lot of his free time collecting stuffy toys. Before he lies down for a nap he'll surround himself with stuffy toys. Although Rocky puts a lot of effort into rounding up toys, he doesn't exhibit any aggression towards his foster brothers or sisters if someone else wants to play with one. One thing is for certain, this is one playful, goofy boy. It's a laugh a minute with Rocky in our home. Rocky is curious about the kitchen counter tops and has been caught surfing. He is learning that counter surfing is a bad thing. He responds well to a stern "NO." Rocky is respectful and seems to learn from his missteps. Rocky wants to please his humans. He would do well in a home in which he gets lots of attention. If you are looking for an interactive pet, Rocky is your greyhound.